Today my Windows XP cd was giving “cyclic redundancy” error 🙂 That’s why I tried to create a new bootable copy. I googled and found this article in CDBurnerXP’s KB. 1st of all I downloaded nLite 1.4.9.1. We can customize our XP cd using nLite. It can help you in integrating service packs, removing extra programs, services etc. Other features include support for password protected Word and Excel files, InTact Technology for retaining 100% file formatting when editing files on the device, the ability to view, edit and create Excel charts and decompress, zip and send e-mail attachments. 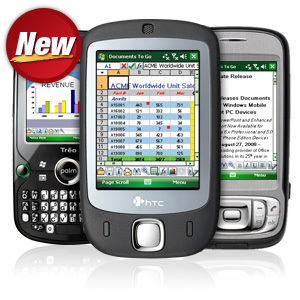 Documents To Go is available for a wide variety of Windows Mobile Pocket PC devices such as the AT&T Tilt, Palm Treo 750 and Palm Treo 800w to name a few. An optimized version to support high resolution screen devices such the HTC Touch Pro and HTC Touch Diamond will be available in the next several weeks. The Windows Mobile 6.1 updates have been slow to roll out to current Windows Mobile smartphones, but looks like today is the lucky day for Sprint HTC Touch owners. Available for download from HTC’s Web site, the software update doesn’t just bring the latest mobile operating system. You also get upgraded to EV-DO Rev. A; advanced GPS with support for Sprint Navigation; the Opera Mobile Web browser; and a full onscreen QWERTY keyboard.